Virtual Dog Shows! What Will They Think Of Next: Virtual Veterinarians? 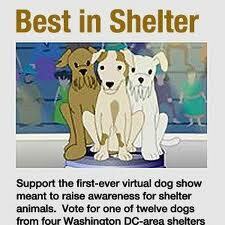 ‘Best in Shelter (www.bestinshelter.org), a nonprofit organization aimed at raising the public’s awareness of animal shelters, is pleased to announce the winning dogs of the first virtual dog show. There are some great benefits in staging a dog show on the web – access to wider audience, saved travel time, reduction in the spread of contagious disease etc. You can also ‘Like’ the winner on Facebook. Still, for the purists there is nothing like the feel and atmosphere of a real dog show.